Summary: 1970: In an overcrowded Stockholm subway station, a harried father and his two boys are late for their train. Joel, the youngest, is howling in his stroller and his seven-year-old brother, Kristoffer, refuses to take the elevator. Today: Joel, now an adult, goes missing in suspicious circumstances. His frantic wife turns to Danny Katz—an old friend with a troubled past—for help. A brilliant computer programmer and recovering heroin addict, Katz is also the divorced father of two young girls. Katz begins to dig behind the digital veil in search of Joel, even though the investigation quickly interferes with his duties as a parent. Before long, Katz discovers he isn't the only one trying to find Joel. THE BOY IN THE SHADOWS is a Swedish novel written by Carl-Johan Vallgren that is expertly translated into English by Rachel Willson Broyles. In June, 1970 a father and his two sons are at a train station in Stockholm, Sweden when circumstances lead to the kidnapping of the oldest son, Kristoffer. The kidnapping was never solved and the parents die 10 years later of an apparent suicide leaving the younger son Joel to grow up under the care of his wealthy grandfather Gustav Klingberg. Moving forward 42 years to 2012, the younger of the sons, Joel, now active in the Klingberg business empire, goes missing. Joel’s beautiful wife, Angelina, asks Danny Katz, a successful translator and previous heroin addict to help find Joel. At one time Joel Klingberg and Katz worked together as interpreters for the Swedish Ministry of Foreign Affairs. It seems Klingberg spoke highly of Katz to his wife and she reached out to Katz for help. Although he had no investigating experience, the need for money drove Katz to accept the job. The investigation takes Katz on a bizarre journey that not only puts his life in danger but exposes him to many of the secrets of the Klingberg family, including their history of voodoo. The case takes him from the underground drug world of Stockholm to the Dominican Republic to Haiti. Katz is pulled back into memories of his drug induced past and when he is accused of murder he seeks help from the two best friends of his youth, Eva Westin, now a public prosecutor and Jorma Hedlund, recently released from prison. Katz soon discovers that he is a bigger part of the case than he could have ever imagined. 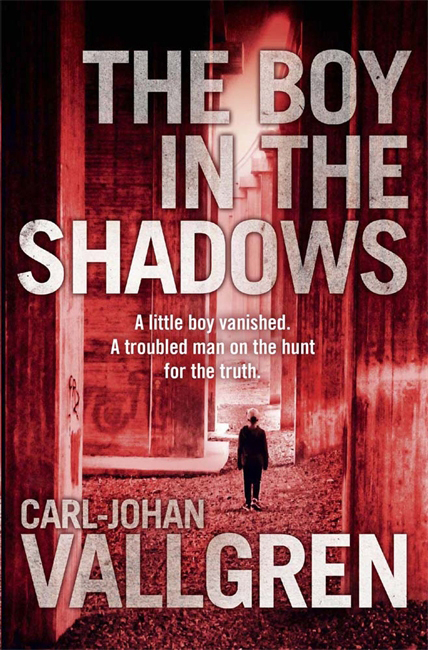 In THE BOY IN THE SHADOWS, author Carl-Johan Vallgren has developed very strong but flawed characters, and many of them have dark and chilling personalities. There are no “white hat” characters in this novel. Vallgren has created a well-executed plot that takes the reader through a myriad of twists and turns that keeps the final conclusion a secret until the very end. This is a very good addition to the thriller genre. I think that in Dannie Katz and Eva Westin, Vallgren has created characters that readers may see again. Thanks to the publisher for providing a review copy of the novel and to Booking Pap Pap for his review. This is such a bittersweet time for you and an exciting time for your college girl! Thanks to Booking Pap Pap for another great review. This sounds like a good thriller.